You've come to the right place for a complete discussion about Baby Hand Casting. Baby Hand Casting involves a fairly simple procedure using very safe materials. We have done baby hand castings of babies just 2 days old. Have mom holding the baby on her shoulder with the arm and hand hanging down. This works best with baby asleep or very calm. Roll up the sleeve of the baby. Mix the alginate- we recommend our 380-CC alginate for this. Put alginate into a "Dixie" type plastic cup. Push the baby's hand down into the alginate. Wait about 30 seconds until the alginate "sets". Gently wiggle the cup and pull it off the hand- very easy to do. Mix the LiquiStone casting stone. When the casting stone is set, remove the alginate from your finished casting. You can generally do about 5 baby hand castings with ONE pound of our alginate. We sell a Baby Hand Casting Kit which makes all of this much easier. The kit even comes with two bags of alginate just in case the first molding attempt doesn't work out so well. The procedure is very easy and the casting stone that comes with the kit is very hard when finished. It should last a lifetime. 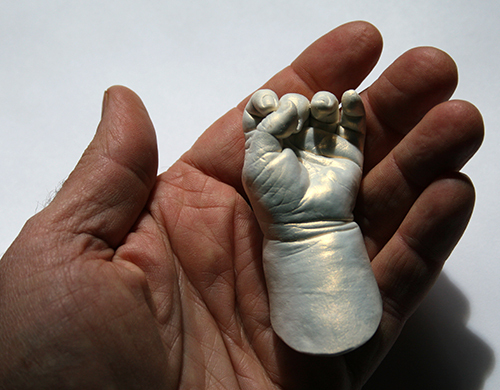 HERE is a link to the Procedural Guide to our Baby Hand Casting Kit.